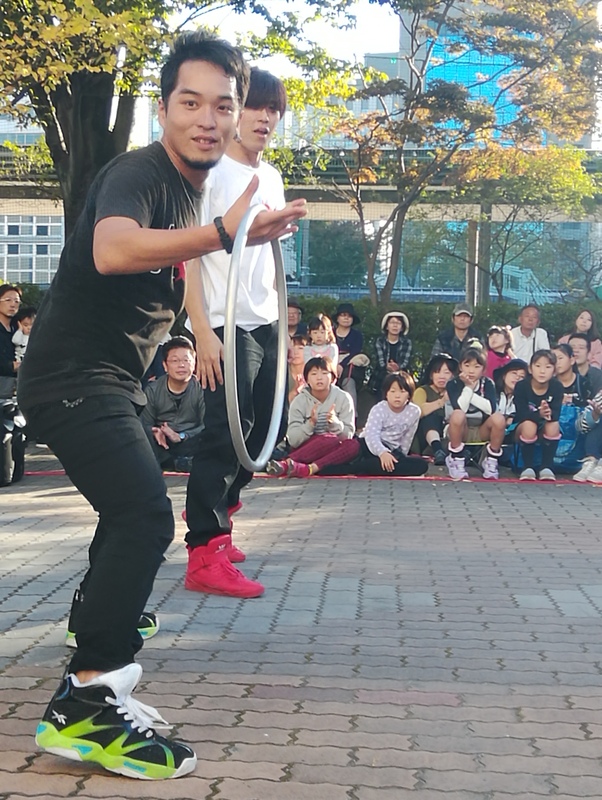 This is Freestyler NARI's second time to take part in the Daidogei World Cup, continuing from last year in the Fringe department. 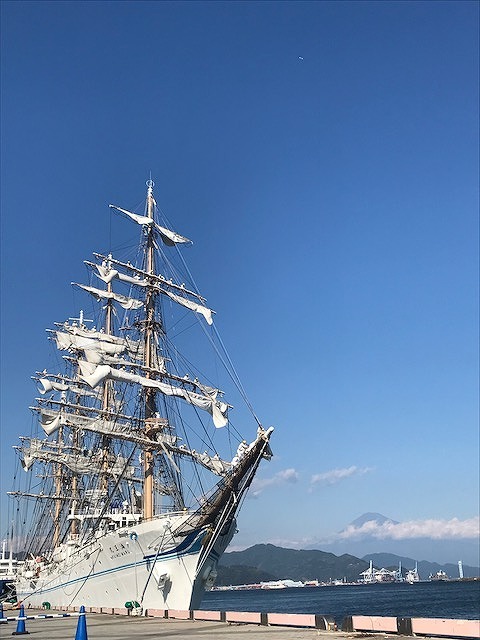 He was welcomed again by the warm crowd of Shizuoka. NARI started performing when he was a sophmore in junior high school in Osaka with his friends. Since then, he has been performing by himself. He is self-taught in dance and acrobatic moves with his friends and incorporates these elements into his freestyle basketball performance. 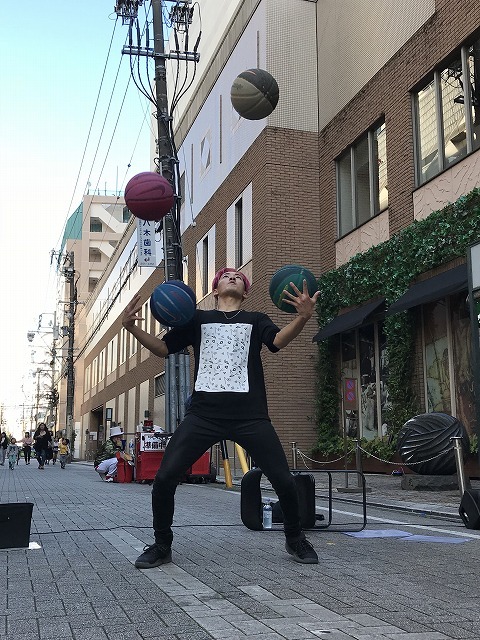 Originally, NARI wanted to be a basketball player, but decided to focus on ball-handling technique when he realized he couldn't be a professional player. When he started to polish and master his ball-handling skill, he decided not to give up his dream this time. For the last 10 years, NARI has been playing MIYAVI's songs during his performance and dreamt about performing with him. Last year, he won the dance contest run by MIYAVI and got to perform with him on his tour. Now one of his dreams has come true, he is focusing on the next dream; performing at Nippon Budokan. His dream to perform at Nippon Budokan is just another step for his bigger dream to make this world a better place. As a message for future performers, he said it is very important to focus and work hard toward your dream. Futhermore, he also feels they should voice their opinions and need to find the way to appeal to their audience. The way he keeps focusing and chasing his dream is an example for future performers to follow. 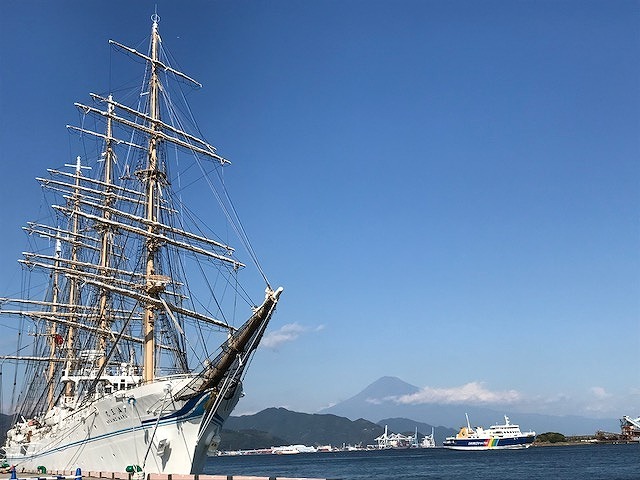 Did you see the noble women riding upon two beautiful white swans? 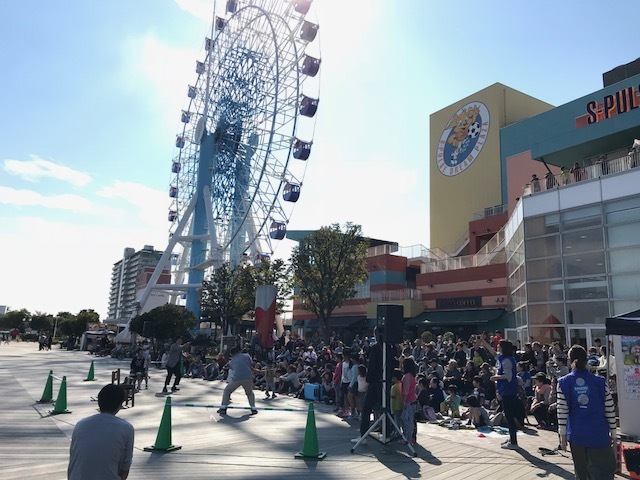 It sounds like a scene out of a fairytale but performers Erica Vicenzi and Barbara Frizzi, of Italy's Teatro per Caso, bring this fantasy world to the streets of Shizuoka's downtown, with their graceful stilt-walking and magnificent costumes. 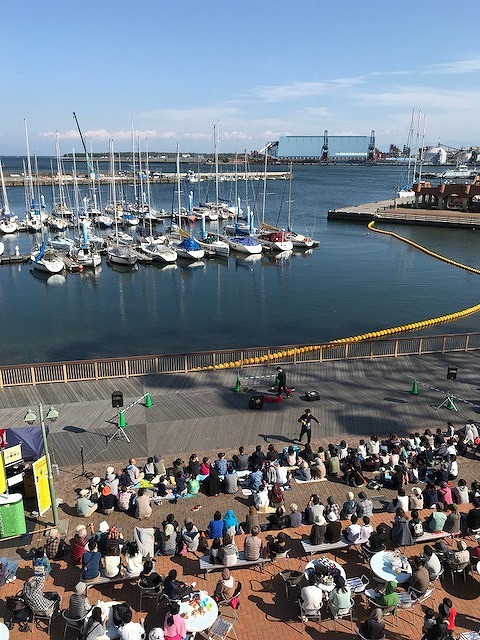 With 21 years of performing experience, starting in children's theatre, creating new things for street theatre has become their passion and life. The elaborate costmes are created and handmade by Barbara. 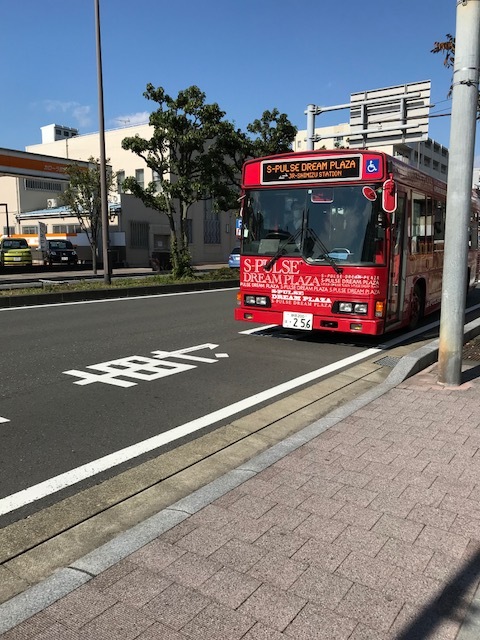 2017 is the second time for Teatro per Caso to participate in the Shizuoka Daidogei Festival. 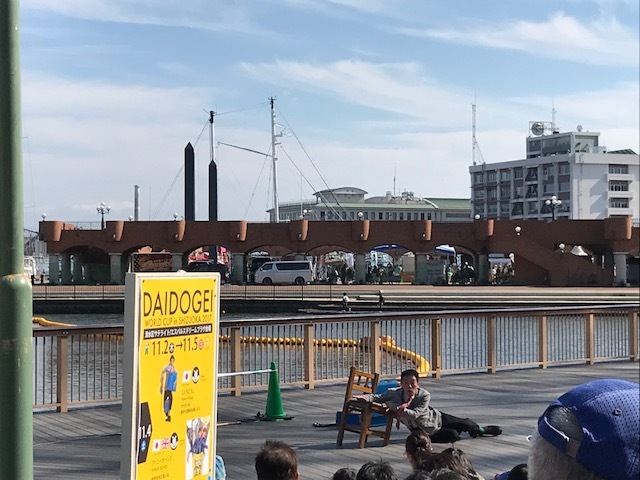 They love coming to Japan, especially the Daidogei, as it provides them with the opportunity to learn - both from the reactions of a Japanese audience, and the other top class performers taking part in the street performance world cup. Not only for us, but also for the swan stilt-walkers this four day festival is like a dream, where the smiles and good feeling of the audience inspire Erica and Barbara to do their very best. To become a performer of Teatro per Caso is not easy: it takes a lot of hard work, training and also technical study, so it challenges both mind and body. 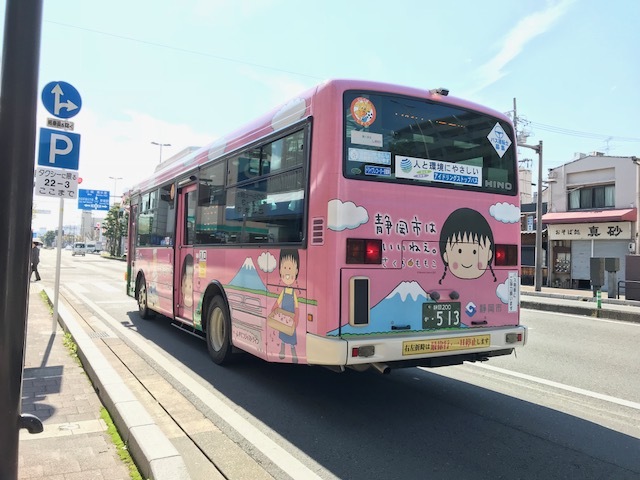 However there is nothing that compares the smile of a child reacting to their performance, so the street theatre is a good life! 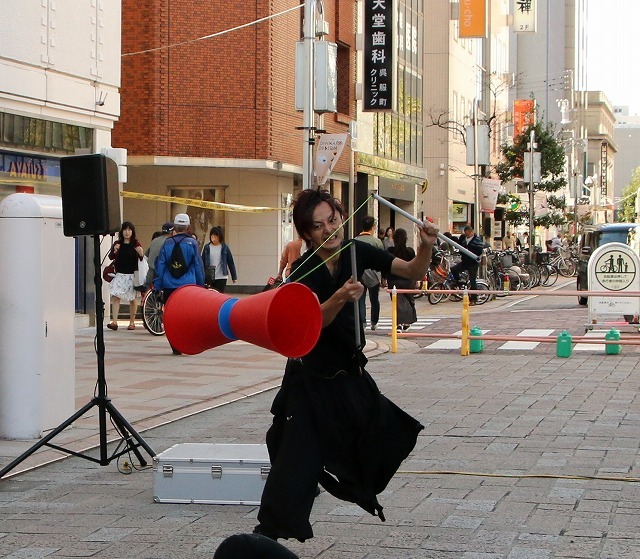 Teatro per Caso would like to express their gratitude to the audience of the Shizuoka Daidogei Festival. 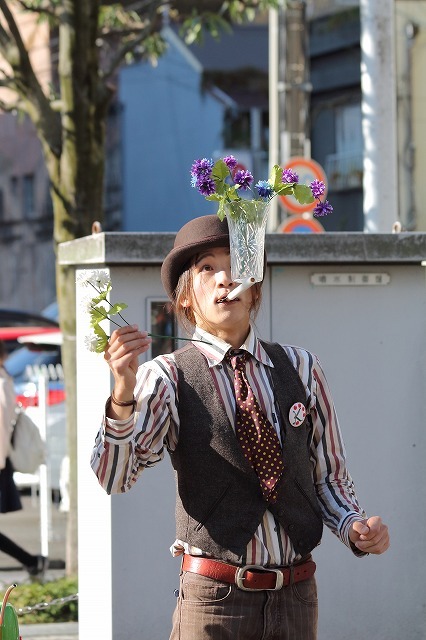 Over on Ao-odori Street was a performer. 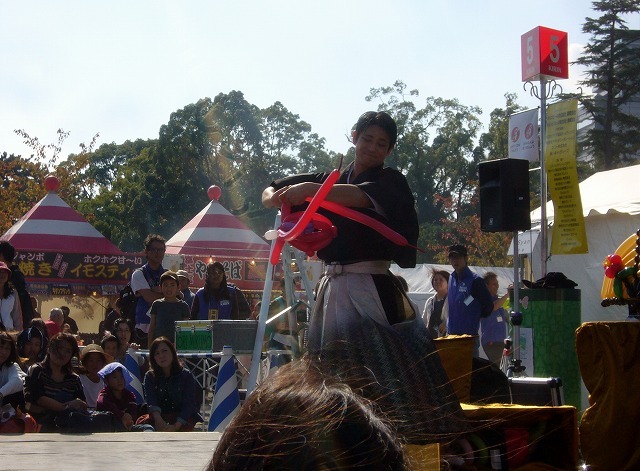 This performer really has a passion for juggling and everything related to the circus. 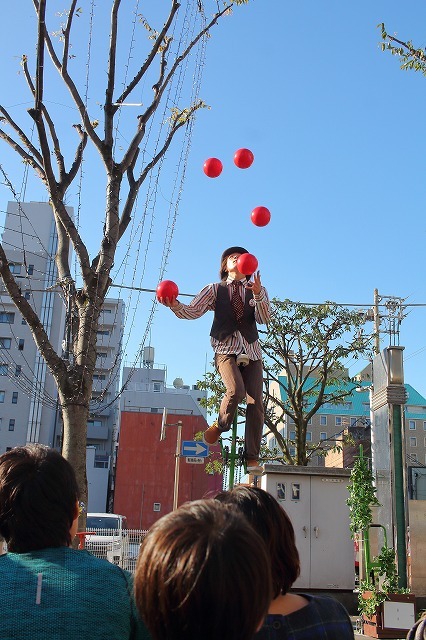 Kent started juggling at the age of 17 with golf balls, but eventually graduated to red balls about the size of melons. 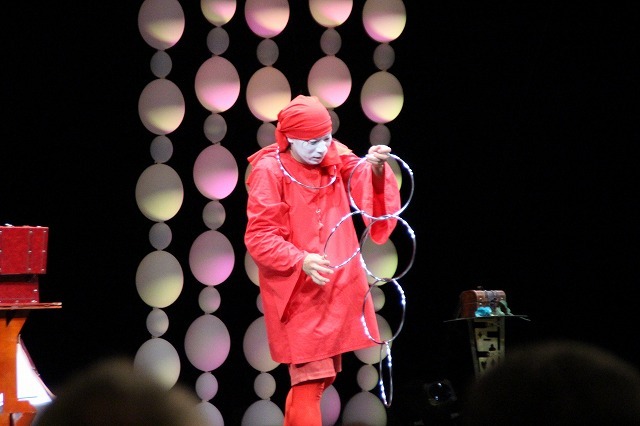 He ended up juggling 7 of these balls at the same time during his performance. 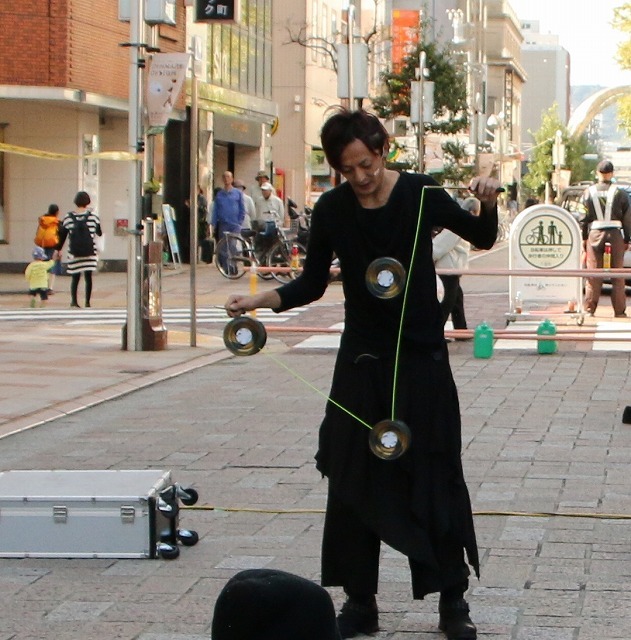 Now at the age of 22, Kent is a 4th year at Japan's only Circus School in Gunma Prefecture. 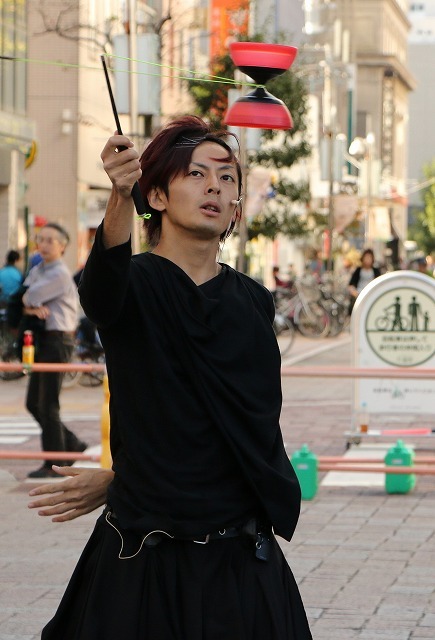 The training shows, as he was able to pull off incredible feats, such as stacking 4 poles (2 meters each) on top of each other, balancing it on his forehead, and throwing a ball into a cup on the top of the pole. Throughout the act there was an impeccable sense of rhythm as he managed to finish complicated tricks at the height of the songs. And even when there was a mistake, his youth and charisma carried him to a wonderful finish. I had trouble writing this article. Not because there were no words, but rather I had no words to officially appreciate the talent that was on stage. 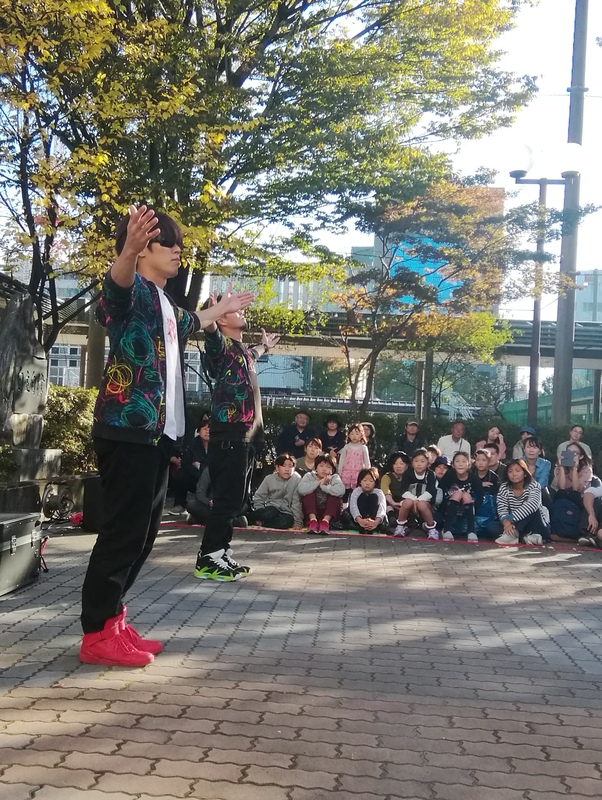 First, the break dancing that we witnessed was truly championship level, as evidenced by the number of championships that the pairing of Yuuto Beats and Takuya Chojin. 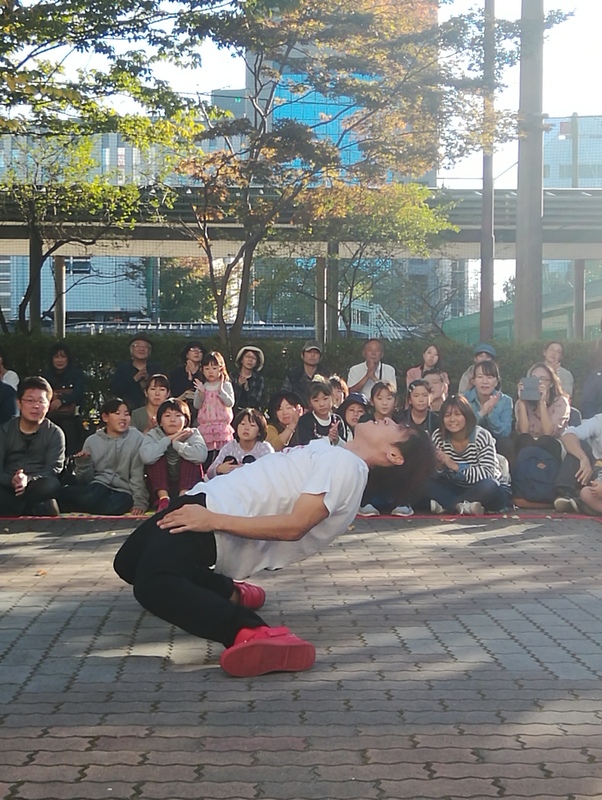 One of the most interesting points during their 20 minute performance was when they invited one of the audience members to join them in their dance. Holding hands in a line, they managed to make a man in his 50s dance like a break dancer by simple muscle manipulation. 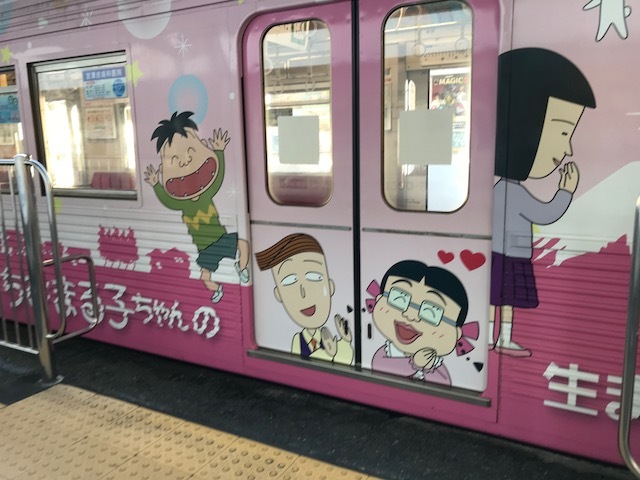 Also, their comedic timing was also spot on, though considering they are from the Kansai Region, it is to be expected (many comedians are from Kansai). Most of it was done through gestures rather than words, making it easy for people from abroad to understand when to laugh. This group is amazing, and nothing I can say will be able to portray my feelings. If you have time during the final day on Sunday, please take the time to see this duo.